I’m Burt Totaro, an algebraic geometer. I’m a professor of mathematics at UCLA (Math Department). I used to be Lowndean Professor at Cambridge, hence the posts about Cambridge, EPSRC and the LMS. I sometimes have things to say about geometry — or math more generally, both the subject and the ecosystem. This site started as a utilitarian attempt to gather and organize these thoughts. Some primitive data gathering on what I do on the journals front. 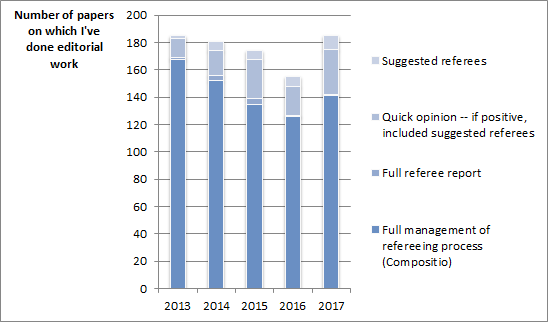 A couple of notes: (a) Between 2014 and 2015, Compositio Mathematica, for which I’m a managing editor, went from three managing editors to four. (b) I don’t do any editorial work for journals published by Elsevier (or serve on their editorial boards or submit papers). (c) In 2016, I made a mildly successful effort to give fewer quick opinions in preparation for becoming an associate editor for JAMS in 2017.